MCMURRAY, Pa. (AP) — Bill Wells has spent the past 33 years saving soles. Wells is a cobbler, and the 81-year-old works seven days a week to repair shoes at his shop, Charles the Cobbler, in Krebs Professional Center in Peters Township. STANFORD, Calif. (AP) — Stanford's best player left the program. Reid Travis is now wearing a Kentucky uniform as a graduate transfer. The Cardinal will try to fill the big shoes of the departed big man, the team's leading scorer and rebounder last season after he was such a fixture during four years on The Farm. LOS ANGELES (AP) — Authorities say 10 people have been injured at a Hollywood rap event after a possible stampede. LOGAN, W.Va. (AP) — Authorities have recovered a body from a river in West Virginia. News outlets cited a statement from the Logan County Sheriff's Office on Monday in reporting the body was found in the Guyandotte River. The sheriff's office is trying to identify the body. The statement says it appears to be a white male who was wearing a blue shirt, blue jeans and orange and black tennis shoes. The body is being sent to the Medical Examiner's Office for an autopsy. 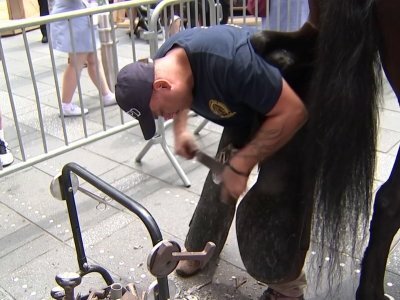 NEW YORK (AP) — It's like AAA for horses. NEW YORK (AP) — Prototypes? Passe. Fashion company Betabrand saw that knitwear was a hot style in sneakers and wanted to quickly jump on the trend for dressier shoes. It put a poll up on its website asking shoppers what style they liked, and based on that had a shoe for sale online in just one week. RICHMOND, Va. (AP) — Ten new historical markers have been approved for placement along Virginia roads, including one that tells the story of a Lynchburg-based football team known as the "Shoeless Wonders." The team of the Presbyterian Orphans' Home played its first games by 1922. The players received minimal coaching, wore second-hand uniforms and competed without shoes except for a boot used during kickoffs. The team was undefeated for at least six straight seasons. SINGAPORE (AP) — Kim Jong Un was clad in his favorite Mao-style suit, wore the same horn-rimmed glasses and maintained his trademark high-cut hairstyle. He didn't carry a national lapel pin and wore heeled shoes when he exchanged historic handshakes with President Donald Trump on Tuesday. VALVIGNA, Italy (AP) — Prada CEO Patrizio Bertelli said Friday the family-owned Italian fashion group has no intention of selling and that his elder son with co-CEO and creative director Miuccia Prada is being groomed to take over. Bertelli said during the unveiling of a handbag production site near Florence that his 30-year-old son Lorenzo "is preparing so that one day he can become the head of Prada," assuming that once he has learned the ropes he also still has "the desire to do it." HIXSON, Tenn. (AP) — A team of students has won $75,000 for a Tennessee high school's arts program by winning the Vans "Custom Culture" contest. News outlets report the Vans Shoe Company planned a concert and cookout Thursday at Hixson High School to announce the victory. The national contest sought two shoe designs: one showcasing local flavor and one epitomizing the company's slogan, "Off the Wall." How many retweets to wear Crocs to graduation? 2018! ST. PETERSBURG, Fla. (AP) — On a whim, a Florida high school senior asked the Crocs shoe company to supply its foam shoes for her and all of her female classmates to wear to graduation, and the company said OK — if her request could get 2,018 retweets. SALT LAKE CITY (AP) — A Utah family has video from a baby cam of an intruder who entered their home, exposed himself and masturbated in a bedroom where a mother and infant child were sleeping. Layton police released a clip of the footage Tuesday in which the unidentified man is partially visible wearing black pants, light shoes and a light-colored sweatshirt. WILKES-BARRE, Pa. (AP) — At Penn-Lee Footwear in Wilkes-Barre, they do business the old-fashioned way. Just like it was done in the 1960s, employees at the privately owned shoe store are dedicated to providing customer service and measure customers' feet by hand. They still use shoehorns and Brannock devices, the standard foot-measuring tools named after inventor Charles Brannock. Red Wing boots and Sven Clogs have a few things in common: Both are brands worn around the world and made in Minnesota, in factories that are about an hour away from the Twin Cities in Red Wing and Chisago City, respectively. And their factory outlets happen to make perfect day-trip destinations, especially if you love shoes. My family made pilgrimages to both this spring. Robert Bowhan grew up near Glenway Golf Course, graduated from West High School and then UW-Madison with a degree in sociology. But after spending years living abroad and traveling the U.S., Bowhan is back in Madison with a trendy shoe store designed to not only sell footwear, denim and T-shirts, but to serve as a gathering place for artists, DJs, skateboarders and other millennials. FRANKLIN, La. (AP) — Walking into Meyer's Shoe Store in downtown Franklin is like taking a step back in time — and it is. The Friedman family has been merchants on Main Street since 1908. A front page ad on a replica of The Banner-Tribute dated April 29, 1959, reads, "A. Friedman & Son, 51 Years of Successful Merchandising in Franklin." Plum Rotary is collecting gently used shoes for children in Nicaragua. Shoes can be dropped off at the borough building at 4574 New Texas Road and at the S&T Bank and the Shop ‘n Save in the Holiday Park Shopping Center, 2362 Golden Mile Highway. Rotary collected more than 600 pairs of shoes in 2014 and 275 last year. It hopes to collect at least 125 this year to reach 1,000 for the three years it has held the drive. Red Wing Shoe Co. culled through about 600 stories submitted by customers since fall, telling of how they wear their boots, and selected 32 of the tales to showcase in a new two-story Wall of Honor display, which opens Monday at the companys retail store in Red Wing. Steve Warwick remembers when Albert Miller walked into his Colfax store in 1972, carrying an attache case. “Are you interested in a new line of shoes?” Miller asked. At the time, Warwick’s Sport Shack carried only guns, fishing tackle and Wilson Sporting Goods equipment. Sure, Warwick said, he’d give it a go. Soon enough, Warwick was selling blue-and-yellow waffle trainers, a simple and sleek shoe with a big fat swoosh sewn to the side that looked screaming fast. Nearly 25 percent of older Americans will fall this year, leading to a variety of serious injuries. Falling is the leading cause of injuries and deaths among people over age 65, resulting in fractures and brain injuries. Most people are probably familiar with the expression "If Momma ain't happy, ain't nobody happy!" There's a lot of truth to this statement in that mothers can set the tone for the entire household. This same principle applies to how one part of the body can affect the whole. I always say "If Momma's feet ain't happy, ain't none of Momma happy." WASHINGTON (AP) — You can own a pair of shoes worn in a game by Golden State Warriors star Stephen Curry — and support a cause, to boot. Curry posted on Instagram that he'll be auctioning off the sneakers he wore in Golden State's game at the Washington Wizards on Wednesday night to raise money for My Brother's Keeper Alliance. CLEVELAND, Ohio – In case you needed any proof that LeBron James has a sweet tooth, all you have to do is check out his latest sneakers. James wore a pair of Nike LeBron 15 kicks inspired by his favorite cereal, Fruity Pebbles, during Sunday's loss to the San Antonio Spurs. ST. CLOUD — A St. Cloud woman has created a product that aims to disrupt the footwear industry by making high-heel shoes less of a hassle. After slipping out of her heels countless times going to and from business meetings in her consulting career, Kickstands founder and CEO Michelle Johnson decided to take the matter of the dreaded "heel slip" into her own hands. In any kind of survey of what the city of Beaver Dam needs to have, a shoe store emerges as one of residents' top picks. That desire was answered when Shoe Sensation opened in the Heritage Village Shops, 1645 N. Spring St. Although it’s a bit hidden by the projecting Joanne Fabrics storefront, the vast store contains shoes for people of all ages, in a wide range of sizes and all styles, and in the mid-priced range that most buyers will appreciate.